Use of recyclable material for all packaging by 2025. Paper-based packaging will be sustainably sourced by 2020. Comprehensive recycling information will be provided to consumers by 2020. Mondelez will support industry coalitions and public-private partnerships to develop vital waste-management infrastructure. It is calculated that 150 million pounds of packaging material worldwide will be eliminated by 2020. 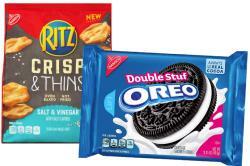 Since 2013, Mondelez International has eliminated 100 million pounds of packaging material. This has been achieved through redesign of tubs used in the U.K. using less plastic, reduction in use of corrugated paper and diminishing the thickness of packaging films. Sustainability in packaging is an irreversible trend and will have implications for food producers in their relationship with customers and through public perception.